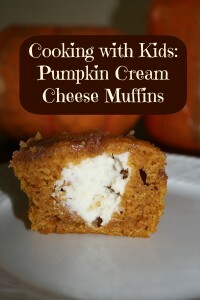 When I saw this Pumpkin Cream Cheese Muffin recipe, I knew we would be trying it at home. These muffins looked so yummy! 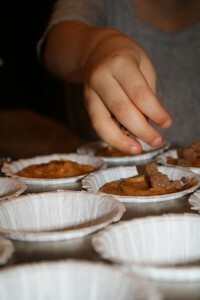 And even if you don’t use the recipe for cooking with kids, you’ll definitely want to try them! Since Lovey enjoys baking with her Mimi, I thought they would have a good time baking these together. Mimi and Lovey bake together a couple of times a week, and I love to watch the learning and bonding that goes on during this special time. I will warn you that cooking with kids is not fast. We typically plan to double the prep time when we are doing a cooking with kids activity, and that was the case with this recipe. However, it would have been faster if I wasn’t trying to take pictures the whole time. It helps to gather all of the ingredients before getting started. That way your child doesn’t lose interest. Depending on your child’s level of interest in cooking, you may also want to prep or pre-measure a few items. You know your child best. 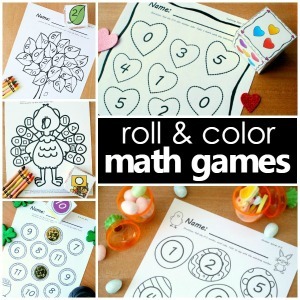 You may want to prepare some of these steps alone and then include your child for only certain parts. 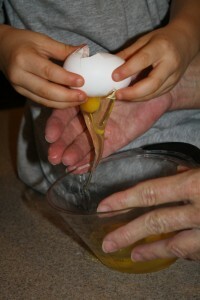 We have broken the recipe down for a child to help with the entire recipe, but do what works best in your kitchen. Kid Job: Dump cream cheese and powdered sugar in a small bowl. Team Job: Combine with an electric mixer until smooth. Place bowl in refrigerator until needed. 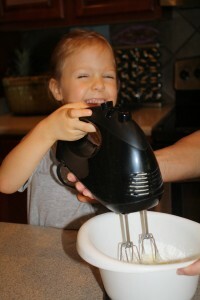 Lovey always giggles when she feels the air from the mixer blowing in her face. Kid Job: Use a butter knife to cut butter into small pieces. 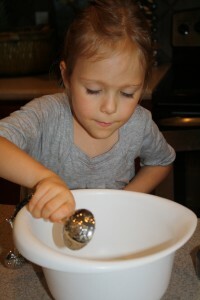 Kid Job (w/adult help): Combine the sugars, flour and cinnamon in a small bowl. Grown-Up Job: Using a pastry cutter, mix the cold butter into the flour mixture until crumbly and well combined. Place in refrigerator until ready to use. 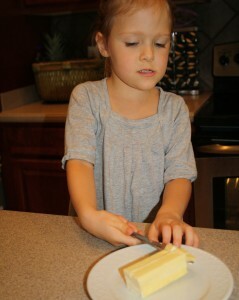 We’ve been working on using a butter knife, so this was great real life practice. *The original recipe includes 1 and ¼ vegetable oil and no applesauce. Grown-up Job: Preheat the oven to 350 degrees (F). 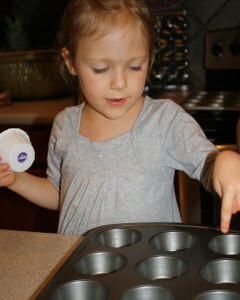 Kid Job: Prepare two muffin tins with cupcake liners and set aside. Kid Job (w/adult help): In a medium bowl, combine the dry ingredients (flour, cinnamon, nutmeg, cloves, salt and baking soda) and whisk to combine. In another bowl, combine the eggs, sugar, pumpkin, applesauce and oil. With a hand mixer, beat on medium speed until well blended. Slowly add the dry ingredients and mix just until combined. Grown-Up Job: Assemble the muffins by spooning a generous amount of batter into each cupcake tin, filling each paper about 1/3 full. Grown-Up Job: Use the remaining batter to cover the cream cheese ball and fill each tin to about 2/3 to 3/4 full. 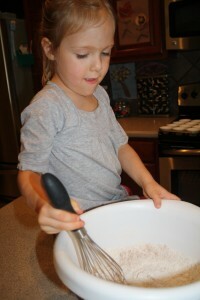 Kid Job: Sprinkle a tablespoon or so of the sugar/topping mixture over each muffin. Grown-Up Job: Bake for 20-25 minutes or until a cake tester comes out clean. Cool completely before serving. This recipe makes 22-24 muffins. 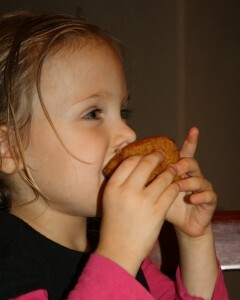 My “eat the frosting only” kind of girl ate this whole muffin and asked for more! 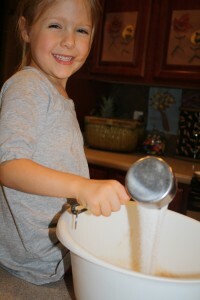 I thought maybe you’d like this recent post: Make a photo recipe book with your kids! They ARE delicious!! Now you have me thinking about fall 🙂 Your photo recipe book idea is adorable. I pinned it…thinking it would be a really cute gift from my daughter to her grandmother. They love to bake together! Love anything with pumpkin! 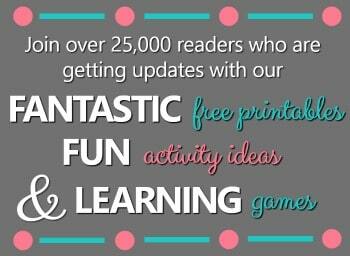 I’m so super glad you shared at Must Try Monday. I always love having new people join in. Have a great day! Thanks so much for welcoming me! I’m drooling! This look amazing! Thank you for sharing the recipe!